I have been doing lots of research over the past couple days because my acne just doesn't make sence to me. I went from moderate to severe within a matter of days... and it all happened after I got strep throat. I searched the org and other websites and concluded that perphaps its a staph infection I have since it all seemed to add up. First off, I have been getting random bruises on my legs ever since I got strep throat.. i'm not sure if that has to do with anything, but I figured that maybe thats a sign of something. 2nd, After I got strep, I got this HORRIBLE breakout on my face... and I mean TERRIBLE. Very painful inflammed lumps that had a clear fluid inside that would leak sometimes... After the fluid leaks, a yellowish brownish crust would form ( ). Of course, I thought this was all just acne.. I went to the derm, she said I could go on accutane.. but she also prescribed me minocycline and prednisone. When I was on prednisone, all these symptoms went away.. no more bruises on my legs, the inflammation on my face went down a TON and there was barely any leaking fluid anymore. Now that i'm off the prednisone and only on minocycline.. my face has yet again exploded in painful, itchy, red inflammed zits that have a clear fluid in them.. and i'm yet again getting this icky crust around many of these zits.. and if I try to exfoliate the crust off or scratch it off, a clear liquid oozes out again The minocycline doesn't seem to be working. In fact, I think i'm having an allergic reaction to it because my eyes and face have been swollen.. and last night my throat was a little swollen..
Anyways.. for those who know anything about staph infections, does this sound like a case to you? If so, how can I treat it? hmmm... It certainly could be, PM Wynne - she's a registered nurse. I would definitely see a doctor ASAP. Whether this is a staph infection or a reaction to the minocycline, it sound serious enough that you should see someone about it. I know the mino can have all sorts of side effects and can induce allergic reactions in some people (skin rashes, dizziness, skin discoloration). I do have a doctor appointment on tuesday to get "screened for depression" before I start on accutane... I should probably ask about this too and see what the doctor has to say.. Regular staph can often be treated with Betadine, I believe wiped down every 4 hrs. MRSA staph of course cannot. I'm with Willow, see if you can get in tomorrow for a culture, especially being that your throat is swollen. Ayla, my throat is barely swollen now though luckily (just a very tiny bit). It was last night that my throat was swollen... but today, mainly my face and eyes are very puffy. I believe that I am having some reaction to the minocycline though, so for now, I stopped taking it. If I wake up tomorrow and my eyes/face are still puffy, then i'll know its not the mino. I'm also going to call up my derm tomorrow and ask what she thinks of all this... i'm kind of worried to mention any of this impetigo crap to her though in case she changes her mind about accutane or something. (i'm so paranoid ) I did PM Wynne by the way! I hope I can figure out whats going on with me..
Oh, Ayla, I looked up about MRSA's... and wow, definitely sounds like my case. I'll try to get an appointment for the doctor's tomorrow, but I doubt I can get in.. its very difficult. BUT, I do have an appointment on tuesday. I will bring this up and ask if she can give me a culture. Does that mean they swab the back of my throat? Go to your doc! With all those symptoms you cannot be too careful. I cannot diagnose; I am just a nurse! With your throat swelling the other day, that is very concerning. Please go to your doctor. I'll be happy when I know you've gone to your doctor or to a doctor and are getting treatment. Sore throat, yes they will likely swab the back of your throat. They might culture the drainage from your wounds. They might get more blood work done. Just go! what a joke, ive been left with numerous scars now, as i went on accutane for 5 months and obviously was breaking out the same the whole way through!!! I'm going to the doctor tomorrow and i'm not leaving without getting a cultur done I decided. I've dealt with acne since 5th grade and have never in my whole life seen any zits like these before.. espessially zits that are "weeping" this strange clear fluid. I also wanted to mention that i've been getting really swollen around my left eye and partially around my right eye... could this be related to a staph infection too by chance? 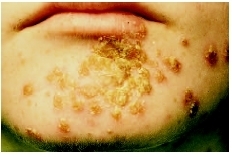 i had impetigo as a teen and both times it went away on its own in a few weeks although it was nasty experience. antibiotics should clear it either topical or oral or both. careful with prednisone its a steroid and they thin the skin out over time. they work by interrupting dna synthesis which brings down inflammation but also does other nasty things like give your stretch marks if you take it too long. the same thing can happen with the topical steroids they frequently prescribe to bring down accutane rash. The crusting sounds more like impetigo to me than acne. I'm sure you've looked at pics, but does it Look anything like this?? It's a lot more common in children, so I'm kind of surprised it would happen to you. I agree that you should see someone else about it ASAP. I agree. Get to a doctor. I'm glad you are going today, let us know what you find out, Mandy. Good luck! the google pictures make it look kinda painful I'm sorry you might have it...but on the positive note, maybe you don't have to go on accutane then ?? Ohh I still definitely want to go on accutane though because before all this crap happened, I still had very moderate acne that I could never control (since 5th grade! Its been mild and moderate on and off)... but if this is impetigo, my acne wouldn't be NEAAAAAAAAARLY as bad as it is now. In fact, i'd probably still look normal and I probably would have been able to continue going to school rather than being homeschooled like I am now. The google pictures though is nothing what my face looks like by the way haha, that looks like a really bad case of impetigo My face just looks like severe acne with a lot of yellowish goldish crusting in some areas. poor Mandy. I hope they can get this cleared up for you soon. Is it strange to say that I HOPE I have impetigo? Then I can get to the bottom of whats been going on with me.... impetigo is pretty easy to cure with a heavy duty antibiotic (me and my doc are pretty sure i'm resistant to all other antibiotics, including penacillin at the moment)... then hopefully my skin will clear up a lot before starting on accutane and I wont deal with this clear fluid leaking from my skin day and night Its so painful.. If it's impetigo (i.e. staph or strep) and it sounds a lot like it then hibiclens (aka hibiscrub) is one of the topical treatments for it. It also has anti-acne properties, and I didn't find it hard on my skin (and most things are hard on my skin) but YMMV. Oh yeah, and minocycline also does work a bit as well, but it's distinctly second-rate on staph and strep. Yeah if I do have impetigo... the doctor also said that there's a possibility that i'm resistant to antibiotics... which is why my skin didn't change when I was on penacillin and minocycline (if anything, my skin got worse on minocycline )... i'd probably have to treat it with a more heavy duty antibiotic. And i'll check out hibiclens, I was reading a thread about that the other day.. sounds interesting. I'm a bit paranoid to try it though in case i get it in my eyes haha.